“WE” is a squadron of brightly painted wooden boxes, buttresses, squiggles, pyramids, chevrons, marquees and clouds. The artist trio LET’S has created a room-size carnivallike exhibition at the MadArt space in South Lake Union, in which visitors can collaborate on the soundtrack and light show. We’re all kids at heart – give us flashing lights, bright colors and a percussive soundtrack, and we’re hooked, whatever our age. Casinos buy into the concept, as do pinball arcades, pachinko parlors and just now, the creators of the multimedia installation “WE,” currently on view at the MadArt space in South Lake Union. 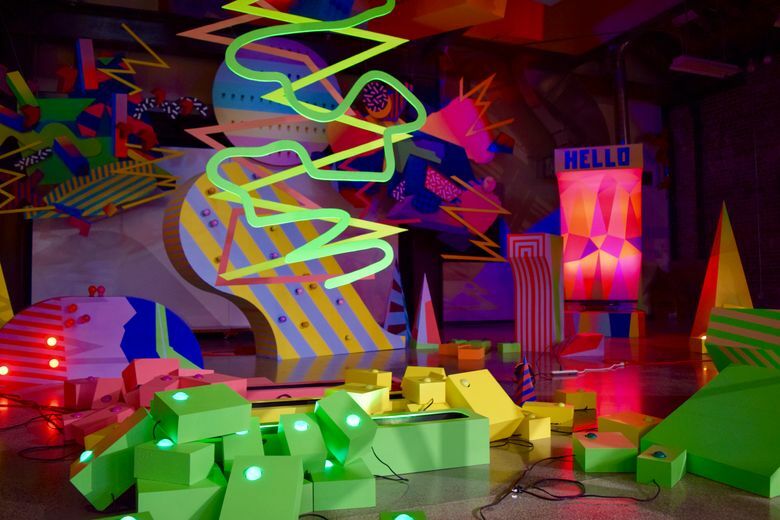 The three-person art team LET’S — Andy Arkley, Courtney Barnebey and Peter Lynch — has been responsible for a series of fun-house sound-and-light extravaganzas popping up around town in recent years at places like Bumbershoot, and the Seattle and Tacoma art museums. The latest version is the biggest and most ambitious yet, the size of a stage set and full of eye candy. Perhaps we’re in the workshop of a carnival, where the signs and backdrops are assembled. Other elements seem like pieces of a video game, rendered in three dimensions. 10 a.m.-6 p.m. Tuesdays-Saturdays through April 22, MadArt, 325 Westlake Ave. N., No. 101, Seattle; (206-623-1180 or madartseattle.com/). The squadrons of brightly painted wooden boxes, buttresses, squiggles, pyramids, chevrons, marquees and clouds don’t move, but they almost appear to, the product of hundreds of progressively flashing lights and clever video projections. The projections consist of pulsing or scrolling images of patterns similar to those painted on the various constructions, and giving a viewer the impression that the wooden surfaces themselves are stirring into action. Individual sections of “WE” are programmed to light up as a unit, and each unit has its own soundtrack. The musical effects are familiar bits and pieces from the world of pop music — looping high- and low-pitched drum sequences, echoing electronic pings, moaning synthesizer whoops and zaps, and earworm organ riffs — meant to be layered one on top of the other for the full disco effect. A dance floor, in fact, comes to mind when all the tracks are activated and the entire array of colored lights flash and flicker: Let’s party! The most intriguing aspect of “WE” (hence the name) is the way the activity is controlled. Each sound/light component is turned on by a comically large control button, staying on only so long as the button is pushed. Since the buttons are installed on a widely spaced series of pedestals, the only way to get everything running is to be joined by a few friends, or cooperative strangers. Having used a similar strategy on others of their works, the artists describe watching spontaneous collaborations emerge as viewers realize the virtue of coordinating their musical and visual contributions. Visiting the gallery one weekday afternoon, I enjoyed providing the rhythmic accompaniment to another visitor’s “melody”; I’m not quite sure they noticed or appreciated my contribution. In fact, your ability to change the soundtrack is limited, as many of the musical bits are pre-programmed with a particular rhythm and pitch; adding and subtracting layers is the main user input. I found myself wishing that the soundscape wasn’t quite so conventional, and gave a bit more freedom to the viewer. Why settle for the sort of throbbing electronica that fills the air in so many clubs and bars, when the music accompanies a sculpture with such a distinctive personality? Of course the installation aims to please, and on that level it completely succeeds. Artists can respond to current events by directly addressing the issues of the day, or they can create an uplifting alternative, as the LET’S team has chosen to do. Who’s to argue with their message that by working together (on our side-by-side consoles) we can light up the world — with a beat? Artist, author, and critic Gary Faigin is co-founder and artistic director of the Gage Academy of Art on Capitol Hill.